To clarify, if I'm looking down on the dual gang, lugs 3-2-1, is 'A' the bottom row and 'B' the top? ^^ Either mate, it doesn't matter which you use. Yup. It doesn't matter which you use for "A" and "B", as they work just like two separate pots. How does it work with 3 pots, is there an x, y and z axis? Z axis is the top knob. I need to check it, but if that third axis is 10K, well then... :) X and Y are 5K for sure. That would be a particularly cool way to control an effect. I've seen joysticks on pedals before but thought their function seemed mostly useless, and that they were only being used because joysticks are cool! :o) But this would be different. By the way Vince, if you build this you could still test it on a breadboard before the pot comes by just using a couple of 5K resistors and links. Hi, I made this pedal about 6 months ago from Mike Livesley / Doug Deeper vero layout. I made it because the few demos I found on youtube sounded good. I used five knobs. My Engl is like that, effects that sounds great with some amps just sound utter shite through it. In fact my favourite distortion pedal ever is the Zoom HL-01 (don't laugh it's brilliant!) and it sounded great through everything I ever put it through and all the other amps I currently own. When I got the Engl I tried it through that and it sounded like a swarm of bees. Worst pedal ever. Just goes to show the variations that you can get in amps that may be similar in a lot of other ways. Another good reason why Harmony Central and TGP reviews are mostly useless unless you find a reviewer using exactly the same gear. Yes, I agree on the variations you can get with amps. The worse thing you can do, is gig without your amp but take your pedal board and just plug into the house amps. You just don't know how you will sound. Come to think of it the amp we use (Yamaha DG-80 112) doesn't like fuzz, as I tried a Big Muff and it also sounded awful. The only fuzz type pedals that I can get a good sound out of are the Woolly Mammmoth and an old DOD Punkifier we had. I am building The Frantone Peach this week to see if that suits. All other types of pedals can sound good in the front or effects loop. uhh... ya. this thing is super badass. i'm definitely gonna be tryin it this weekend. thanks mark! Yup. Just finished this circuit as a five knobber and i have two words. Sick. Fuzz. On a side note, the pinout of MPSA13 is 180 degrees of the current image. I have MPSA13s from two different batches and they are both the same way. Cool, so you have two frequency pots? If so, do you think it's worthwhile or do you get the full range of sounds by moving them together? Seem to work nicely as separate pots too. Moving both to same position makes the frequency just tighter and more focused - Two pots give way more possible settings... Dual pot will result in tigher control that equals in more focused sound. As it is so over the top, i don't see myself boxing this anytime soon (or ever). Nice experiment though. Finished today too... Very "Roadrunner" -sounding for me!!! Good job. Did you use dual pot or two 5Ks? Yes i am. I use 10K dual. I can't wait to build this one. I am doing the offboard wiring now. 1: Off the vero it says 'Res 2&3', I assume that means that it connects to B 2&3 on the 5k dual lin pot the same way that 'Res 1' connects to A 2&3 on the 5k dual lin pot? It is just written differently. 2: 'Volume 2 to output', can someone clarify this? Is this on the switch or the jack? If the jack is it the tip or the sleeve? I put the volume 2 to the footswitch where the output normally goes... I get no sound other than clean guitar with a volume cut. 1: Res 2&3 means that you bridge your 2&3 lug of your Resonance 10klin pot. And a wire from the board to lug 2 or 3 of that pot. 2: volume 2 to output is indeed the output on your footswitch. Ah, I put the 'Res 2&3' to the frequency dual pot not the 10k... that explains it. Easy fix if I understand it correctly. In summary, 'Res 2&3' go to the 10k bridged 2&3, but then the 10k 3 ALSO goes to the dual 5k 3? Nevermind, I figured it out. Brain fart. Got it to work! I was going insane with this one because no sound was coming out of it, then I saw the fatal flaw in my build: a transistor running one space to far... de-soldered it and installed it correctly and this thing is in beast mode. Straight onto my pedal board this thing is going. Are the Resonance and Freq pots really supposed to work "backwards", ie. that the highest fizzes can be heard when Freq pot is turned counterclockwise all the way? And when the Freq pot is in zero position the Resonance pot hasn't got any effect on the sound? I'm about to start building it, but just a noob question first. Why does the original pedal have 3 knobs and the schematic here has 4 (if we use a double one) or even 5 (if we use to linear ones). Which one is missing in the original??? Sorry if the question is too lame, but I'm new to these matters! I'll reply myself: In the website the pedal has 4 knobs! The one in this video is kinda weird. The pedal in the video lacks "Tone" knob i think. Built one today, really unique, never built anything like this. Its kind of like a cocked wah and fuzz together, but a very grainy fuzz, and it never gets ear piercing like some resonant filters can. Really nice pedal, and great layout. Built this and I'm waiting to wire. It says Freq A1 and B1 to ground, do they both go to ground and the ground to imput jack ? Im using your Offboard Wiring diagram. Im great at the populating/soldering, buy lack the wiring knowledge to finish project. But your insight has helped. 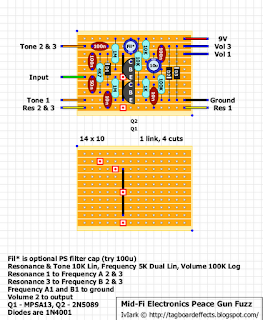 and one last thing: is the Fil* optional PS filter cap a 100u capacitor?, and is the diagram of electro caps marked with a mins sign? Yes, they both go to ground, everything that goes to ground, has to be connected to the negative pole of your power supply. Yes, the optional filter cap can be anything from 100uf upwards, 100uf is generally fine though. Yes, the negative side of the capacitor is marked by the grey strip. I'm getting gating / dying notes above the 12th fret on the high E. Any ideas? thanks for the great job you have done here. I already have built a few of the layouts. I'm looking for the sound that I heard in the video at 2:48 where he turns the volume down on the guitar. can I add a volume in front of it .input to 1 , 3 to ground and 2 as the new input.is that it? is 100k ok? to add an input volume control you'd want the input to go to lug 3, lug 2 would go to the board input, and lug 1 ground. Thanks a lot . should I then add a booster after it ? Is it good practice anyway? thanks again. Hi, is there really 50n cap? I can't find any 50n caps on market. Any nearest value is fine and probably still within component tolerances. Just use a 47n. If you want more bass input try a larger value. hey there, just got done building this one...sounds great!!! thanks so much for all the work you guys put in here. i have the feeling that the tone is kinda dying with the string swinging less and less. is this normal (of course, besides that the tone eventually stops when there's no input anymore ;-) or could it be a broken part or some mistake i made? cheers and keep it up!!! Is there a way to add a switch to bypass the fuzz (or make the fuzz much less fuzzy), and keep only the resonant filter ? Also, does the resonance goes up to self-oscillation ? (if not, is there any way to increase the resonance) ? Ok, i built it today, and i confirm that is sounds amazing. I can also confirm that it seems that the filter and the resonance pots are backwards. I suggest to add an input gain pot, as changing the input gain makes the sound change drastically. Having both a filter and a tone pot is great to create many different sounds.